While Carl has only been on the board 2 years, his impact has been great. He has served on both the board development committee and he was the co-chair of last year’s very successful golf event benefitting orthopedics. He has also been personally involved in securing more than $100,000 support for our hospitals. In addition to serving on the Foundation Board, he has served on the City of Chandler’s Board of Adjustment, has been a member of the Chandler Chamber of Commerce, and he served for many years on the advisory board for the Chandler/Gilbert YMCA. 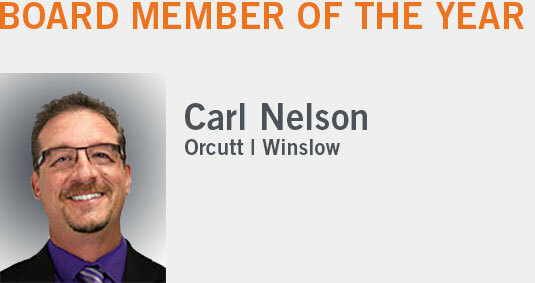 As one of 5 managing partners at Orcutt|Winslow, he champions community service and involvement. This award thanks him for his service.